Made of durable microfiber material, these reversible cover are perfect for teens who want to have options with their style and design. Using the same color combination, these covers give you two different designs with one cover. 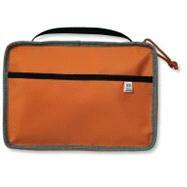 Features include an exterior pocket, exterior zipper, zipper pull, and large pocket for a Bible and/or other items.